Next week is my last week of classes. Like ever. I have spent the last 18 years of my life going to class, and it is all about to end. What's weird is that I haven't even really been thinking about this. It kind of hit me anew this week. I haven't gotten to slow down in anticipation of the finish line. I've been in high gear, and now I feel as though I'm neck and neck with anything and everything that could prevent me from getting my final research proposal approved and turned in for next semester. My schooling has been pretty rigorous overall, so I guess it's fitting for my final week of classes to be a complete doozy. All of my mental and emotional energy at this point is being devoted to preparing for the committee meeting for my project proposal. I will dress up. I will bring baked goods for the faculty members. I will explain my research plans. And I will pray that I find favor with them or that they have mercy upon me or, you know, maybe just that I don't break down and cry in the conference room. That meeting is Monday, and the final proposal is due Thursday, which gives me approximately two and a half days to make any necessary revisions. Though I wish I could devote those days solely to making revisions, I will have to split them among final projects — and the accompanying writing, meeting, data collection, and presentation prep — for three other classes. I've got Haymitch's advice from the Hunger Games repeating in my head: Stay alive. I finished typing all of this and then heard the little beep that tells me when a new email is in my inbox. This one was from my committee chair. "I think this meeting will go very well," she wrote. "See you Monday!" I remember when getting a committee was what I was worried about. And I remember when finding a place to do the professional portion of my project was what I was worried about. I remember when picking a research topic was what I was worried about. I remember when writing my lit review was what I was worried about. And all of that has worked out so much better than I hoped it would. I need to stop worrying so much. 1. Grad school year two is basically a mixture of sophomore slump and senioritis. Not a pretty combination. The newness has worn off. I'm realizing how much work is still ahead. I'm feeling burned out. And I just want to be done. Tell me about it, Eeyore. 3. I just wrote 3 instead of 2. That is evidence of how tired I am. 3. You know how I recently mentioned my newfound love of iced coffee? Well, I don't have a coffee maker at home, but I have perfected making iced coffee with instant coffee, and now I make it every day. After I make iced coffee. I want to be like, EXPECTO PATRONUM, CLASSES. 4. All of this semester's classes have been major letdowns. I feel like I am working my tail off and learning nothing. The only thing I really care about is finishing my master's project proposal, but I have been devoting absolutely ridiculous amounts of time to other classes. Okay, primarily one other class. It is like the Dementor of classes, sucking out all of my joy and will to live. 5. I just reread that last point and was struck by my own bitter tone. Despite my frustration and fed-up-ness with my classes this semester, I realize that I have it pretty good. I go to my dream grad school. I have people encouraging me left and right. I know that so many people have my back. Twice in the last week I have just sobbed in friends' arms. I point this out because it means I have friends in whose arms to sob. I don't want to forget to be grateful for that. 6. Whenever I express excitement about finishing school, someone reminds me that I'll never have as much freedom as I do now. I'm not sure I believe this. I never have the sense of finishing work at the end of the day. I work from the time I wake up until the time that I go to sleep. I do not come home and turn my attention to other things. I come home and continue. Grad school is relentless. This is your brain on grad school. 7. The only way I've learned to take breaks without feeling guilty is to put social events on my calendar. I am completely incapable of relaxing alone when I have this much to do. I could learn a thing or two from Honey Boo Boo. 8. All of this is unhealthy, and I realize it. I feel like I don't have much of a say in the matter. I signed up for these classes. Drop/add is over. My only option is to keep going. Some nights I do go to bed before I have finished my tasks for the day. That is my only way of saying no these days. 9. Every once in a while the triviality of it all hits me. You know, Ecclesiastes-style. GRAD SCHOOL IS JUST A HAMSTER WHEEL. "'Meaningless! Meaningless!' says the Teacher. 'Utterly meaningless! Everything is meaningless.'" If I didn't know better, I would think the first chapter of Ecclesiastes was written by a grad student. "I applied my mind to study and to explore by wisdom all that is done under the heavens. What a heavy burden God has laid on mankind! I have seen all the things that are done under the sun; all of them are meaningless, a chasing after the wind." People when they realize the holiday Starbucks cups are out. Alternately: Me when I think about communications. 10. Every once in a while, my love for the subject matter hits me, too, though. Everyone was freaking out about the Starbucks red holiday cups a couple of days ago, and I literally got shivers thinking about the way Starbucks presents itself as a brand so consistently and deliberately. I want to help brands be that way. And yesterday I was visiting an organization's website, and I got excited thinking about how much thought had gone into making it pretty and practical. These things remind me that I'm happy to be studying strategic communication even on days when I feel like I want to quit studying altogether. 11. I'm getting excited about the prospect of moving back to Kentucky after I graduate. It's hard to do life without family. I'm increasingly aware that other people have families here and I do not. In college I learned that America is considered the most individualistic country in the world. No other culture values "standing on your own two feet" as much as our culture does. In most countries, it would be unheard of for a 20-something girl to peace out of her community and move away on her own. On the one hand, I'm grateful that I live in a country in which that is possible. On the other hand, I think America values individualism too much. Living far from family, to put it bluntly, is stupid and the worst. Even Thor needs his people. How I feel after a successful grading session. 12. I still love being a T.A. It is the only part of grad school in which I feel like I know what I'm doing. It makes me feel like I have a purpose here beyond just my own coursework. I give approximately zero bothers. 13. Speaking of grading, I don't know when it happened, but I have entirely stopped caring about my grades. As in STOPPED CARING. (I'm pretty sure that no one who knows me in real life is going to believe this.) It's not that they're bad and I've given up; it's that there's so much work that once something is turned in, I'm over it. Actually I'm usually over it before it's turned in. 14. I got an ocular migraine the other day, and it was so weird because I had blind spots. BLIND SPOTS, YOU GUYS. I COULDN'T SEE ALL THE WAY. I had to go to urgent care and everything because I didn't know what was going on. I bring this up now because I am having trouble reading this page, and that's what happened right before the blind spots came last time. I can look at the screen, but I can't focus on the screen. It is super weird. 15. ON THAT NOTE I should probably stop blogging. I hope to post pictures soon from Katelyn's wedding and other goings-on. I am also trying to get my friends to do a round-table video blog, so that may be on its way if I can effectively peer pressure them into doing it. 16. 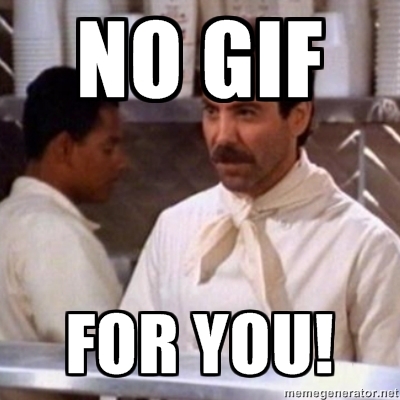 I can't find a GIF for peer pressure that doesn't involve weed, so no GIF for you. No soup for you either. The other memory is of studying for the final exam. My precious iBook pooped out the Saturday before finals, so my mom drove to Asbury to lend me her iBook. I remember that she had almost no music in her iTunes library, but she did have The Prince of Egypt soundtrack, so I played it on repeat all week as I studied. Somewhere in the middle of listening (and re-listening) to that soundtrack and reading (and rereading) my Old Testament notes, I realized that I was just like the Israelites. That's why I loved that class, really: because it made me realize that I was just like the Israelites.This was in some ways, of course, a disheartening realization. (The Israelites, after all, did a lot of stupid stuff. And then they would shape up briefly. And then they would do stupid stuff again.) But it was simultaneously an encouraging realization. Because I saw how faithful God was to the rebellious, wayward, ungrateful Israelites and, by extension, to me. I've been feeling a lot like the Israelites lately. Actually, I've been feeling a lot like one Israelite, good ol' Moses, the Prince of Egypt himself. It seems presumptuous to say I feel like Moses. I'm not like leading people out of captivity or anything. But I have a tendency to act the way that Moses did when God showed up in that burning bush. Basically Moses is chilling with some flocks in the wilderness, and he sees this burning bush, so he goes over to it and realizes that God is talking to him out of it. And God is like, "My people are suffering in Egypt. I've chosen you, Moses, to go talk to Pharaoh and lead the Israelites out of there." Then God promises to go with Moses. And then God tells Moses how he'll do all these wonders. And then God turns Moses' staff into a snake. And Moses — who at this point should be like, "Whatever you say, Lord" — is like, "But I am not eloquent." That's what he says to the God who just talked to him out of a burning bush. He asks God to send somebody else. And God, following up with the best comeback of all time, is like, "WHO MAKES MOUTHS TO BEGIN WITH, MOSES?" And then he sends Moses anyway (with his brother's help and despite repeated protest). *Don't smite me for this paraphrase, readers. This was not exactly one of Moses' finer moments, but this is the moment in which I most resemble him. "But I am not eloquent," I say to God, over and over again, switching out "eloquence" for a hundred other traits or abilities in a hundred other situations. Denying my own "eloquence," etc., might sound humble, but it's really the opposite. It shows that I think my success is dependent on my own abilities. Right now I see this in the worry I've felt about the master's project I'll be working on next semester. As indicated by my last post, prepping for this project has had me way too stressed out. It feels like such a huge undertaking, one on which so much is resting. I look at it, and I look back at God and say, "But I am not capable. SEND SOMEBODY ELSE." Even as God has started to bring project plans into place, I have found new things to think I must complete in my own power. The semester is reaching the point when everything hits at once. (You know how it is: projects in every class, presentations on the horizon, and a dozen meetings scheduled for this week alone). My to-do list feels like a physical weight upon on my chest. I look at it, and I look back at God and say again, "But I am not capable. SEND SOMEBODY ELSE." And God's response is, of course, "WHO MAKES MOUTHS TO BEGIN WITH, MOSES?" Which, when applied to my situation, sounds like, "Who got you into Mizzou to begin with, Kate?" Who let you find out about Mizzou's program in the first place? Who made sure you had time off work to go visit? Who got you accepted? Who got you an assistantship? Who provided you with community when you got there, Kate? You didn't think it was you, did you? If you asked me, I would say that I didn't. I would say that God led me to Mizzou, got me in, provided for me once I arrived. I would say that he'd proved his faithfulness a thousand times in the past year since I began. But when I freak out like I do and worry about my own incompetence, I show just how much I think my success has been and will continue to be dependent on my own abilities. If I really thought I'd gotten where I was due to God's sovereignty, then I wouldn't question my ability to do what's ahead of me. Because it wouldn't be about my ability. I wish that being able to acknowledge this tendency/problem/pride of mine would make it go away. I wish I could wake up tomorrow and take a look at my to-do list and say, "Wow, that is long. Good thing it's all in God's hands and not mine." I expect, however, that I will wake up tomorrow and feel the same way that I felt today — overwhelmed and tired. I expect that I will look at my to-do list and decide to caffeinate myself and attempt to check a few items off it and eventually just call my mom and cry. I am realizing that even overcoming this is something that I cannot do in my own power. I cannot through my own abilities make myself stop relying on my own abilities. That is up to the mercy of a God who's been showing mercy since the days of the Israelites. That is the thought that I will cling to tomorrow. Right now I'm trying to find or create a position (and obtain that position) and pick committee members (and get them to pick me back). GRAD SCHOOL IS HARD.